Arab countries are moving beyond the oil and gas industries to diversify and innovate their economies, and this is where the next wave of global cooperation in commerce and culture can happen, says Omani Ambassador Mohamed al-Harthy. “Most Arab countries, including the oil-and-gas-dependent Gulf Cooperation Council member states to which Oman belongs, lately launched a strategy of economic diversification, focusing on logistics, information communications technology, manufacturing and industry, health care, agriculture, fishery, education and tourism,” he told journalists at the Omani Embassy in Seoul last week. Turning to tourism, the envoy said Arab countries offer “beautiful natural landscapes, rich histories and heritage,” which emerged out of the geography and diverse cultures of the Middle East. Al-Harthy, who doubles as the dean of the Diplomatic Corps in Korea and president of the Korea-Arab Society, highlighted the growing exchanges between the 22 Arab League nations and Korea, as this year marks the 10th anniversary of the society’s founding. 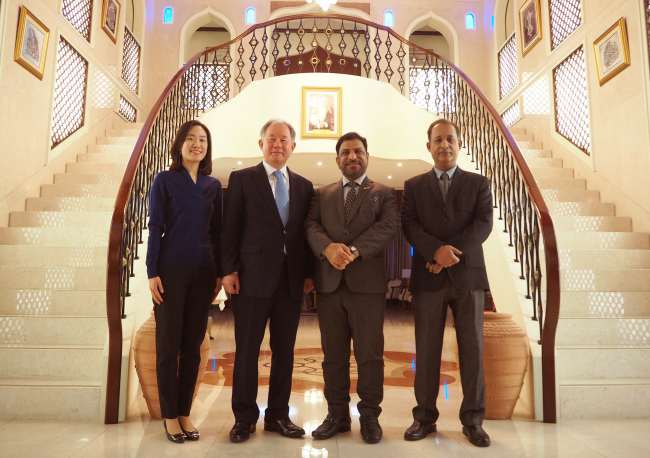 “As a soft power and public diplomacy channel, the Korea-Arab Society has brought our peoples closer together,” he said, adding the nonprofit organization is at the vanguard of fostering connections and communications between Arabs and Koreans. The institution was established in 2008 to promote exchanges and cooperation in business, culture, education, civil dialogue and diplomacy. As the only organization in Asia to host annual festivals in Korea and the Arab countries celebrating each other’s cultures, every year in Korea it hosts the Arab Cultural Festival in May and the Arab Film Festival in June in Korea. These events are followed by the Korea-Arab Friendship Caravan in October and Korean Film Festival in November in selected Arab countries. It also organizes the Korea-Middle East Cooperation Forum, where participants can exchange opinions on major regional issues and build networks between senior government officials, scholars, businesspeople and journalists; and the Korea-Arab Youth Exchange Program through which students from the two sides visit each other’s country to study and experience local culture. Al-Harthy encouraged people to open their eyes to the Arab world, saying fresh new opportunities for entrepreneurship and employment exist there on the back of the economic diversification and globalization efforts. As Arab societies are liberalizing and some are parting ways with conservative strands of Islam, all in an attempt to be more in tune with globalization’s dictates, the envoy stressed that Islam is a religion of peace and that Arab diplomats “always promote the positive image of Islam” to counter depictions in the Western media. “If you study Islam in depth, it is a religion of peace and respect for women. Many women have entered high positions in government, education, medicine and business in Arab societies,” he said. Arabs are active users of social media, including platforms such as YouTube, where they can experience cultural content including Korean pop culture, Kim said, adding that Arab audiences are thrilled to see it firsthand, along with traditional music and dance, at sold-out festivals organized by the institution. “There is a feeling in Arab countries that everything and anything Korean is cool and exciting,” he said.